The Wonderswan is a handheld system designed by the same person as the Gameboy. It has only ever been released in Japan and is unlikely to make it over here. First released in a monochrome version. The actual system itself runs from a single AA battery and features two sets of control buttons so it can be played either horizonatlly or vertically. It came in loads of different color cases such as Skelton Pink or Crystal Blue. Designed by the late Gumpei Yokoi who also desinged the Gameboy. Also comes with its own 'killer' puzzle game Gunpey. It's a bit like a cross between Pipemania and tetris. The updated color version has a much nicer color screen which doesnt show as much LCD ghosting. It also comes in a range of striking clear crystal cases. There is now a new version due out in July (2002) called the Swan Crystal, appears to be a all round upgrade with larger and clearer screen 2.8-inch reflective TFT LCD, better sound, battery life etc. This is a development kit for the wonderswan which allows you to write your own games for the system. A programmable robot bug with various sensors. Kind of like a small bug version of big track which is programmed remotely by a Wonderswan with a radio programming cart. Has the added benifit of being able to sense its surroundings. 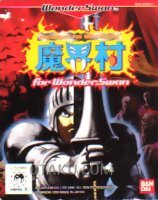 Allows two wonderswan systems to be linked together for 2 player games. There are loads of games apart from Gunpey such as Ghosts and Goblins available for the black and white version of the system. There are only currently a few games available for the colour version such as Guilty Gear X shown. B&W games are compatiable with the colour version.